The captain of an artillery company of South Carolina was killed in a battle in Virginia during the late war. His body was placed in a coffin, which was put into a strong box and carried to the home of his family in Columbia. It arrived there about a week after his death. On his arrival the captain’s dog, that he had reared and petted during his life-time, was at the gate, and approaching the house, began to smell about him with a good deal of excitement. When the coffin was taken from the hearse, he ran under it, and followed it to the house between the pall-bearers. Although a week had passed by since his master’s death, and his body was closely fastened up in the coffin, yet, by the sense of smell alone, the dog had found out that it was his master’s body which was in that coffin, and this stirred up all his affection for him. When the coffin was put on the table in the parlour, the dog lay down under the table, and remained there till the funeral took place on the next day. 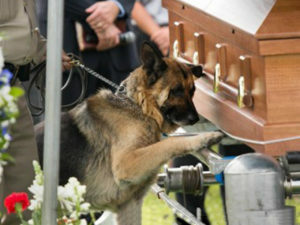 Then, after the funeral, the dog took his place on the grave of his old master. They tried to coax him away, but in vain. He would stay there. He refused to eat or drink, but lay moaning there till the third day after the funeral, when he died on his master’s grave.